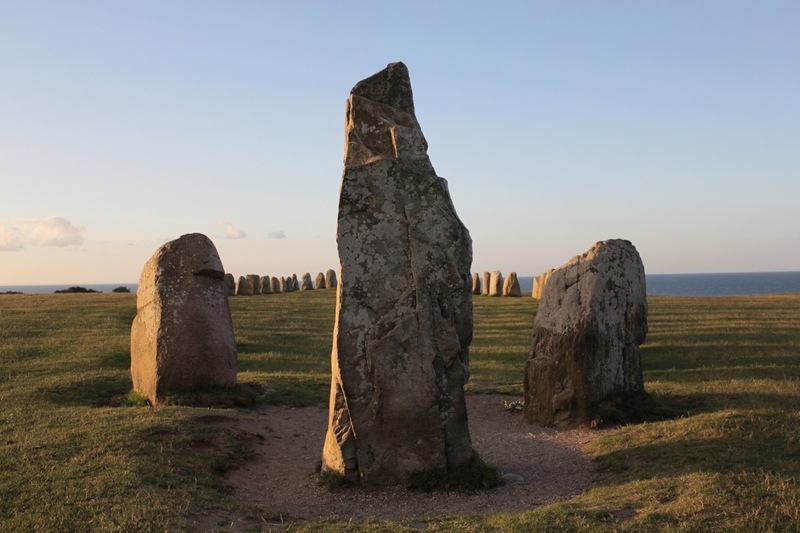 Links Through Space: ASTRONOMY IN STONE: Ales Stenar megalithic site in Southern Sweden, Stonehenge little sister. Had to see it with my own eyes. ASTRONOMY IN STONE: Ales Stenar megalithic site in Southern Sweden, Stonehenge little sister. Had to see it with my own eyes. In 1963, the author Gerald S. Hawkins published an article entitled Stonehenge Decoded. He convincingly demonstrated that Stonehenge in England was an astronomical calendar. Now today the megalithic site of Ales Stenar is being "decoded" as an astronomical calendar as well. Even more, it is said to be a younger sister site for Stonehenge and may reveal cultural, travel, trading influences between prehistoric England and prehistoric Southern Sweden. 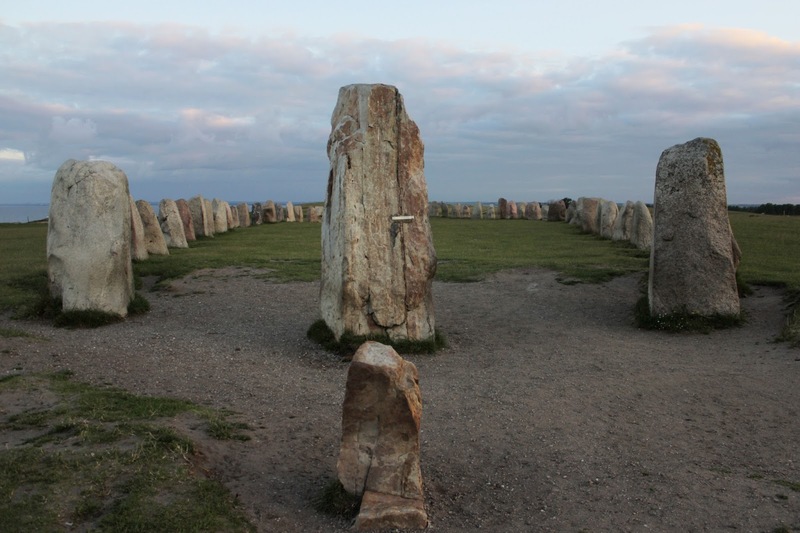 Ales Stenar meaning Ales stones is a megalithic monument in Southern Sweden. It has the form of a 69.8 m. long and 18.8 m. wide ship composed of 57 erected stone blocks. The stone-ship is organized as a perfect calendar recording the annual motions of the Sun. 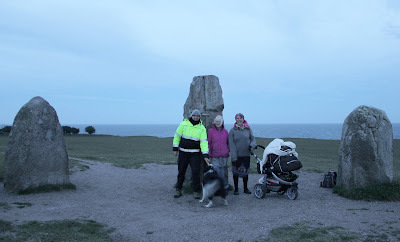 The monument has a remarkable location at the top of a 40 m. high glacial moraine with a steep erosional cliff to the Baltic sea. Me at Ales Stenar at Summer solstice sunrise just before 5 am. The Stem and stern stones consist of quartzite. They are sharp-edged indicating quarrying. Their internal structure reveals its origin in the quartzite bedrock some 30 km to the east of the site. All the other 55 stones in Ales Stones seem to be erratic boulders collected from the surface of the glacial deposits in the surroundings. The individual stones in Ales Stenar are full of cup marks, a favourite object in Scandinavian rock-carving from the Bronze Age. On certain specific boulders of the stone-ship, the cup marks exhibit perfect solar alignments. 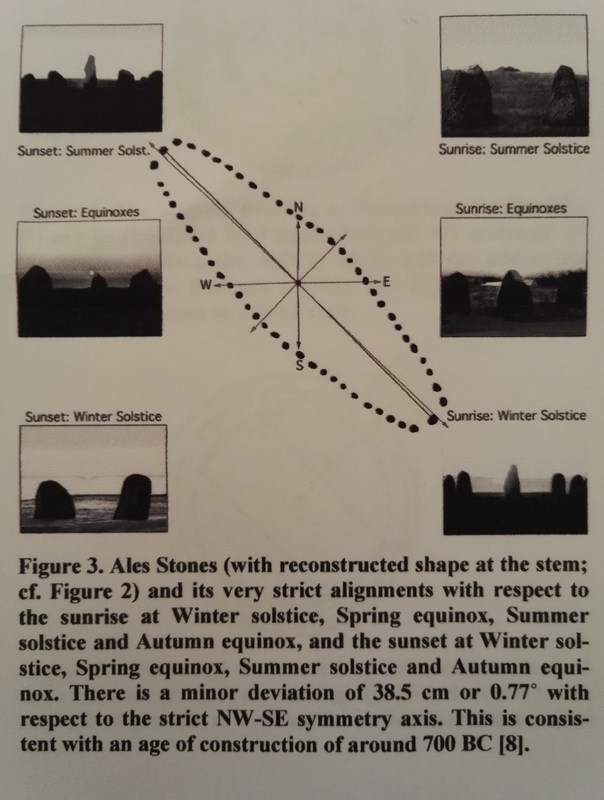 Have a look at the GIF animation below of the rising Sun at Summer solstice between 2 specific boulders and a close-up picture of boulder with the cup marks, indicating the alignment. Almost as if the small cup marks on the boulders represented the true alignment of the stones and the Sun. 2 dots for the boulders and the central dot for the Sun. 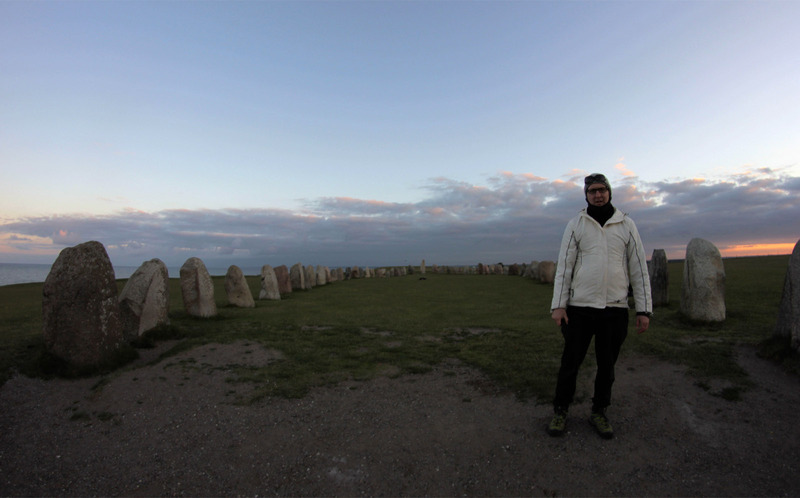 between 2 specific boulders at the megalithic site of Ales Stenar, Southern Sweden. Credit: S. Lamoureux / KTY Toutatis Kustavi Finland. Cup marks on the left boulder in the GIF animation. 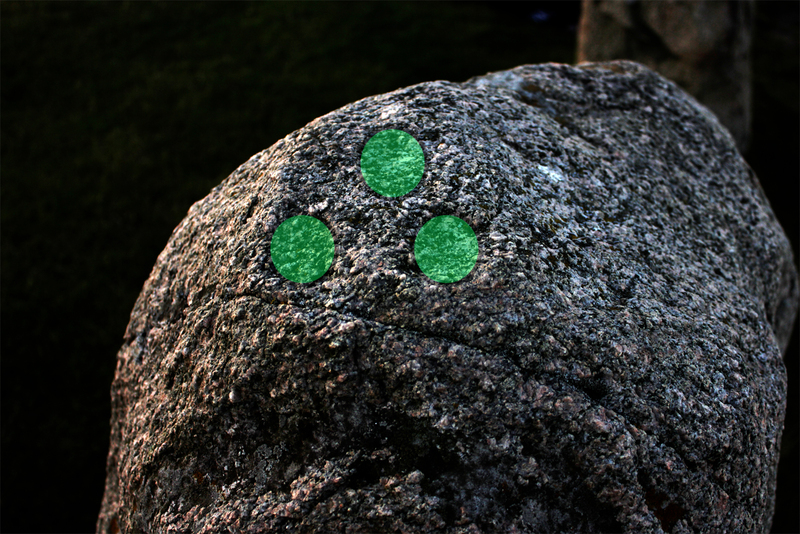 Enhanced with green dots to show their positions on the boulder. Ales Stenar is built so that, seen from the center of the stone-ship, the Sun rises over the stern stone at Winter solstice and sets over the stem stone at Summer solstice. The Sun rises at Summer solstice between the two stones marking the mid-ship, as seen in the GIF animation above. The alignments recorded can not be a mere coincidence. It must be the result of a careful planning. The cup marks on certain "key" stones provide a strong support for an interpretation of astronomical alignments. The form of a ship is, of course, the most obvious shape of the Ales Stenar monument. One may, however, also identify some other basic geometric signs. They are 1) a rectangle. 2) a circle and 3) a line (alignment). We use these 3 geometric signs in a comparison with the same basic geometry of the Stonehenge monument, which are the rectangle, the circle and the line as seen in these drawings below. 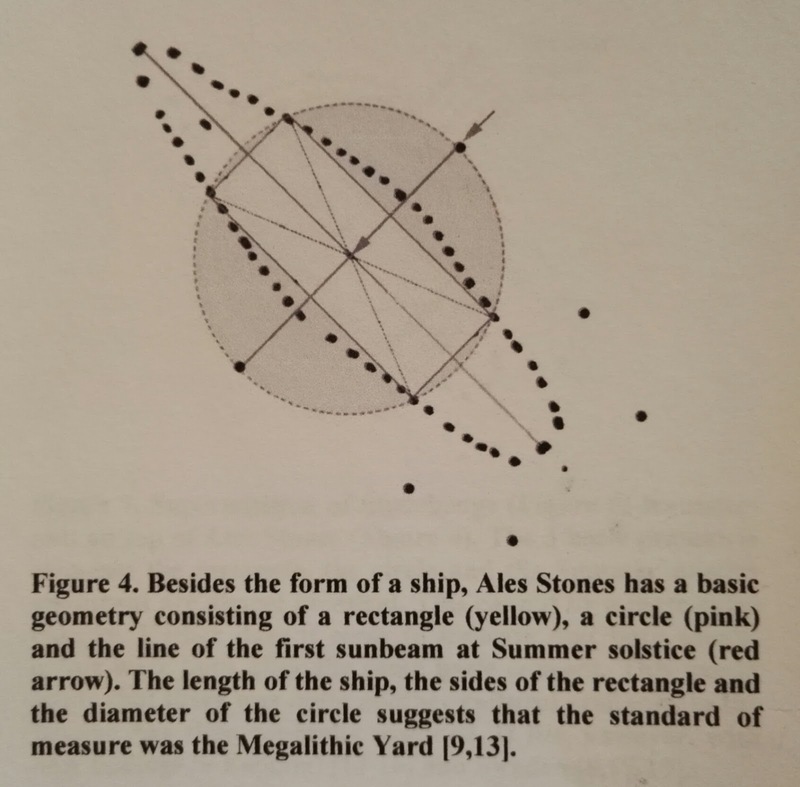 Figure 4 shows Ales Stenar and the geometric forms. 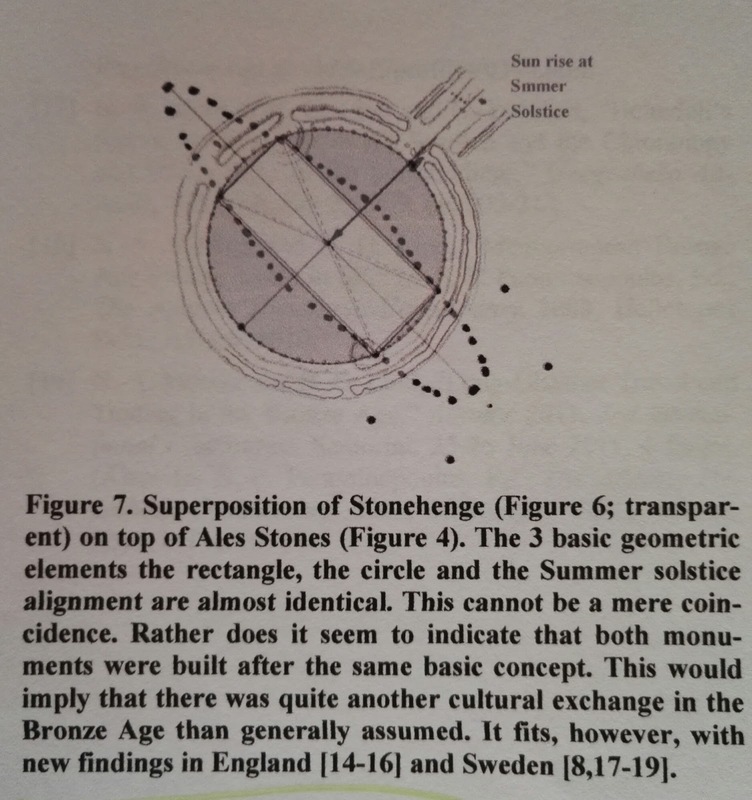 Figure 6 shows Stonehenge and the geometric forms and figure 7 shows a superimposed Stonehenge and Ales Stenar to reveal a almost perfect match of the geometric basic they offer. The alignments are very exact. there is a small deviation, however. 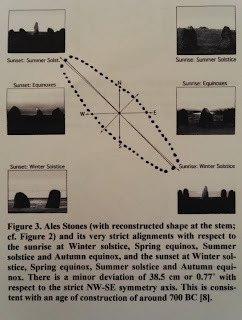 The Sun rises at Winter solstice about 38.5 cm (or 0.77 degrees) east of the center of the stern stone, and Sun sets at Summer solstice about 38.5 cm (or 0.77 degrees) west of the center of the stem stone.This discrepancy is caused by the long-term changes of the tilt of Earth's rotational axis, called the Precession of the equinoxes. Converted to time, this deviation implies an age of the construction of the Sun calendar of about 700BC, an age that fits perfectly well with our stratigraphical records indicating that the stones were taken out of the ground and placed at the site sometime around 600BC. 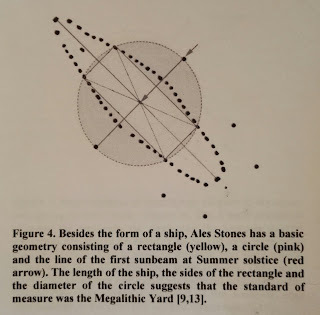 A recent finding is that the standard of measure in association with Ales Stenar seem to fit with the Megalithic Yard (MY). This standard of measure was used over the British Islands during the Neolithic and Bronze Age as well. View of the 57 erected boulders that forms the Megalithic monument. 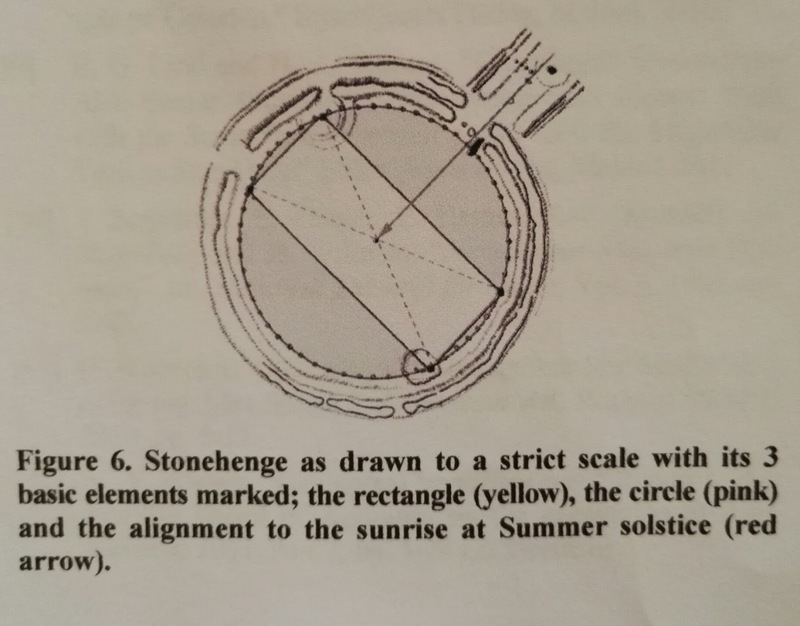 The similarity in basic geometry of Stonehenge and Ales Stenar and the application of the Megalithic Yard as a standard of measure at both sites provide quite strong arguments for a cultural connection, including migration and trading , between Britain and Southern Scandinavia in the Bronze Age. 1963, Gerald S. Hawkins presented his paper entitled "Stonehenge decoded". We are now able to say the same about Ales Stenar. Obviously, it was built as a sophisticated astronomical calendar. 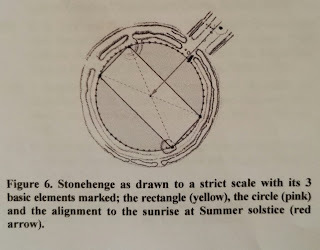 Stonehenge and Ales Stenar are built with the same basic geometry briefly explained in this article. Furthermore, the standard of measure was the Megalithic Yard in both monuments. Stonehenge belongs to the Neolithic period and Ales Stenar to the late Bronze Age. 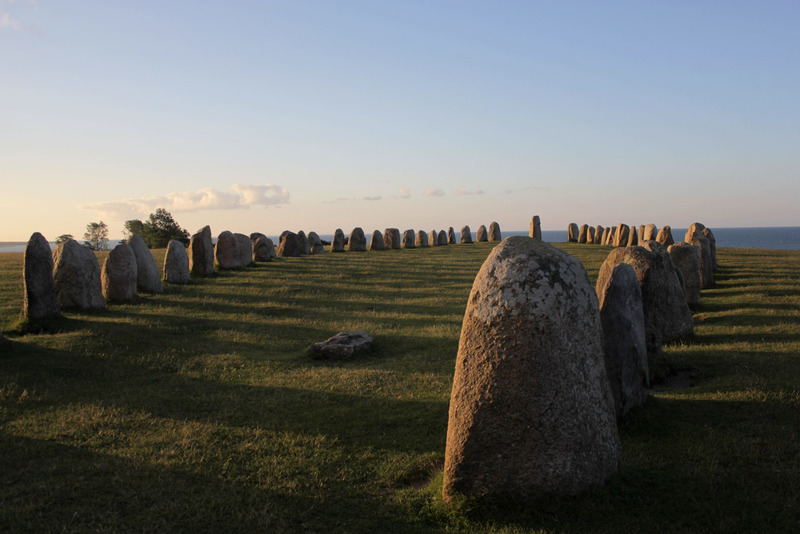 The geometric linkage of the two monuments reveals an influence from Britain to Southern Sweden. One may say: "Stonehenge has got a younger sister---but so much more beautiful". 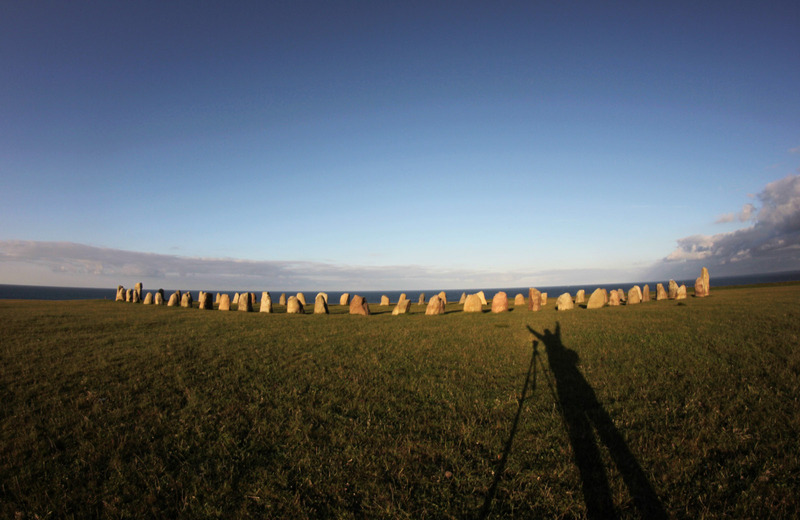 Fisheye view of Ales Stenar Megalithic monument in Southern Sweden. 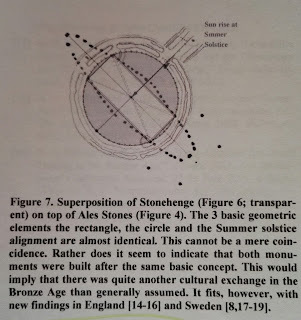 This is an extract of a paper "Stonehenge Has Got a Younger Sister Ales Stones in Sweden Decoded" by Nils-Axel Mörner and Bob G. Lind. Please read the entire paper on the subject (HERE). I visited the site at Summer solstice to witness the alignments, which indeed happened and was amazing. 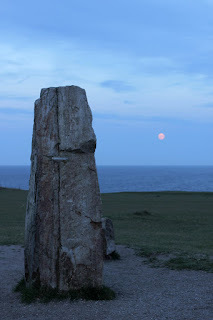 Here are the rest of the picture captured at the Megalithic site of Ales Stenar. All pictures are credited S. Lamoureux / KTY Toutatis Kustavi Finland or else mentioned. 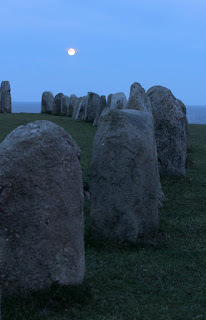 Visitors of Ales Stenar for the Summer solstice alignments. From left to right: Stefan, Eva, Essi and baby Felix (not shown). Ales Stenar monument. Full Moon in the background. View from the stern quartzite stone. Ales Stenar, Southern Sweden. Please have a look at the links below to read more on Ales Stenar.